Good teeth and gums are very important to the health of your dog. The average dog lives 2-3 years longer with healthy teeth than those with gingivitis and tartar. Bad teeth and gingivitis can lead to heart disease, kidney and liver failure, and many other diseases. We recommend you try brushing your pet’s teeth 2 times weekly. You can buy toothpaste and toothbrushes here or at the local Queen Creek Arizona pet store. Some pets tolerate a finger brush very well. Do not use a human tooth paste as these cannot be swallowed. Dentacetic wipes may be used as an alternative to brushing. If you are unable to brush your pet's teeth on a regular basis, ask about our brushless dental cleaning plan option for maintaining your pet's teeth. You can also use dental chews, and we recommend CET HEXTRA chews. A recent study in the Journal of Veterinary Dentistry noted a 46% reduction in gingivitis in dogs that were given rawhide chews. CET chews have enzymes that help eat the tartar off the teeth. The chews also have an antibacterial agent (Chlorhexidine gluconate) that acts like a mouth wash. These additions help to scrape tartar and plaque off the teeth and reduce bacteria in the mouth. If you purchase other chews from a local Queen Creek pet store, please keep in mind that they must be "enzymatic" to be really effective. *Most chews are safe and very beneficial to the teeth, however, if your pet swallows them whole they must be discontinued as they can cause a blockage and may require surgery. Other rawhides/chews tend to cause more problems with diarrhea or vomiting as they are cured with formaldehyde. The CET Chews are cured by a "bake-and-press" method, which make them safer to give to your pet, and easier to digest when swallowed. We recommend starting your pet on Plaque Off. This product bonds to tartar, breaks tartar off the teeth, and helps prevent new tartar from forming. Simply add this powder to your pet's food daily. This product works well for dogs and cats that do not like to chew or are too sick for a sedated dental cleaning. Greenies can be beneficial to the teeth. Make sure your pet does not swallow them whole as they can cause a blockage which may require surgery. Dental cleanings are recommended for all pets with tartar and gingivitis, or for those pets that may require tooth extractions. At The Scottsdale Veterinary Clinic we have great discounts on our Brushless Plan Option for Pet Dental Health. The brushless dental option includes dental cleanings every 6 months to keep the teeth in the best health. These dental cleanings are significantly discounted to make this procedure affordable and keep your pet in the best health. Most dogs and cats will require their first cleaning between 2-5 years of age. Dental disease begins with the accumulation of plaque on your dog’s or cat’s teeth. Plaque is the soft yellow material that is a mixture of food particles, and bacteria. After time the plaque begins to harden and forms the mineralized material called tartar. Before the plaque turns into tartar is when home care is the most important. Once tartar is formed normal brushing at home is not enough to fully remove it. With tartar being formed the environment within the mouth becomes favorable to harmful organisms. When the veterinarian looks at the teeth during an exam a tartar grade is assigned to your pet. This grade is based on the WORST tooth in the mouth. Grade I – When the tooth has mild plaque present but no tartar at the time of examination. Grade II- There is an increased amount of plaque present, and tartar is covering < 50% of the tooth. Grade III – Tartar covers 50-80% of the tooth. Grade IV – Tartar covers 80 – 100% of the tooth. Periodontal disease is directly related to the accumulation of tartar on your dog’s or cat’s teeth. As tartar is changing the environment in your pet’s mouth these new bacteria begin affecting the periodontal ligament. This ligament is responsible for attaching the tooth to the bone. As bacteria gain access to this ligament the attachment is weakened. This creates what we refer to as “Pockets”, and causes loose teeth, bone loss, pain, and eventually teeth will fall out. Grading the severity of periodontal disease while your pet is awake is a guess, based on the amount of tartar, gingivitis, and recession of the gums. Probing for pockets and taking X-rays are the only true way to grade periodontal disease, and this is done while the pet is under sedation or anesthesia. Grade 0 – Some plaque or tartar, no bone loss. Grade I – Mild gingivitis (a red line is visible along the gums), no bone loss. At this point the changes are reversible. Grade II – Moderate gingivitis, less than 25% bone loss, gums are swollen, and bad breath. The teeth may still be salvageable at this point. Antibiotics are generally required prior to dental cleaning. Grade III – Severe gingivitis, 25-50% bone loss, gingival recession, sore mouth, and bad breath. Changes may be irreversible, and the possibility of tooth extractions are high. Antibiotics are generally required prior to dental cleaning. Grade IV – Severe gingivitis, >50% bone loss, severe recession, loose teeth, and bad breath. These changes are irreversible and tooth extractions will be necessary. Long term antibiotics are necessary both prior to the dental cleaning and after the cleaning. We recommend having your pet’s teeth cleaned before they require extractions. Performing dental cleanings while they have low grades of tartar and periodontal disease has many benefits. Benefits include: Lower cost to you, decrease stress to your pet, and more options for the type of dental performed. An animal that has a Grade I periodontal disease has the option of undergoing a conscious sedation dental or a traditional dental. However, an animal with Grade III periodontal disease only has the option of a traditional dental with anesthesia. Differences in these procedures are explained below. For a traditional dental cleaning, your pet is placed under anesthesia. The use of anesthesia is generally very safe. Before administering any drugs we perform a blood profile that will allows us to access the function of your pet’s internal organs. A doctor will perform a physical examination. These two steps are performed to answer the question, “Is this animal healthy enough to undergo anesthesia?” Once your pet is anesthetized a technician trained in anesthesia monitors the animal’s pulse rate, respiratory rate, and temperature. Price Includes: Basic chemistry/CBC blood profile, pre-anesthetic evaluation, anesthesia, ultrasonic scaling, oral charting, dental probe, low speed polish, fluoride treatment, IV fluids, antibiotic injection, pain injection, dental x-rays. Conscious sedation dentals are an alternative to tradition dental cleaning for some pets. These dental cleanings are performed under heavy sedation (“Twilight anesthesia”), instead of full anesthesia. Since we are not performing anesthesia a blood profile is usually not required (Unless the pet is over the age of 7 years). 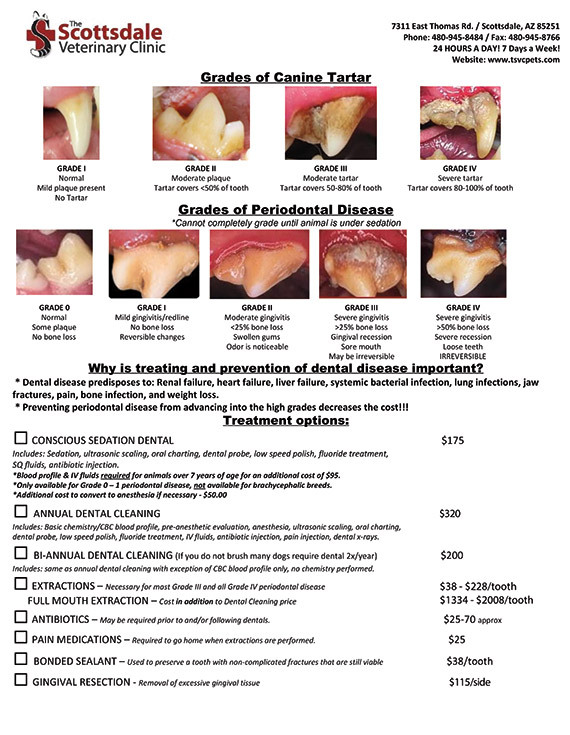 This service is only offered to pet’s who are estimated to be in Grade 0 – 1 periodontal disease. These periodontal grades are difficult to predict in the awake patient, and there is a chance some teeth will be found that are a grade higher. At this time anesthesia may need to be induced to properly clean and assess the affected tooth. The conscious sedation dental option is also not available for brachycephalic breeds (Pugs, Bulldogs, Persians, etc. ), or sick animals. Price includes: Sedation, ultrasonic scaling, oral charting, dental probe, low speed polish, fluoride treatment, SQ fluids, antibiotic injection, and dental x-rays. * If your pet is over the age of 7, it is required that a blood profile be performed & an IV catheter be placed to deliver IV fluids. The additional charge is $95. At TSVC we do not support or recommend anesthesia free dentals. While we cannot explain the purpose of cleaning your pet’s teeth to him/her, it is impossible to expect your pet to fully cooperate while we attempt to perform this service. Imagine someone holds you down to attempt to clean your teeth and never mentions their intentions. This would be a terrifying experience for all involved. Additionally, a thorough oral examination is impossible in the awake patient. Anesthesia free dentals are incomplete services, leading to a false sense of preventing dental disease. One of the most important aspects of the dental cleaning is removing tartar from below the gum line, and cleaning out the pockets, this is impossible to perform in the fully awake patient. We offer FREE dental examinations performed by one of our certified technicians. Please call to schedule a time to come in. During the examination, if your dog or cat is found to have more severe dental disease a doctor will need to assess your pet and may need to prescribe antibiotics. If this is required an examination fee will be applied, and the appointment may need to be rescheduled based on Doctor’s availability.